I am delighted to report that within a day of the first view of Luna 21 and Lunokhod 2 since the end of that mission in 1973, the sister mission, Luna 17 and Lunokhod 1, has also been found -- and this time by Russian scientists. They discovered the location of the lander and rover in Lunar Reconnaissance Orbiter image M114185541RC. Again, it was Sasha Basilevsky who let me know of this by email. He said that his colleague Albert Abdrakhimov was the one who located the lander and rover, and made various checks (comparing the image to earlier maps and also to the rover's panoramic views of its landing site) that convinced Sasha and others that, indeed, this was Luna 17 and Lunokhod 1. A portion of Lunar Reconnaissance Orbiter photo M114185541RC, with a 1978 map of the Lunokod 1 traverse superimposed. The identification of Luna 17, Lunokhod 1, and the rover's tracks was made based on analysis of the Lunokhod navigation records and TV camera panoramas. Unfortunately, I don't currently have a version of this image without the annotation. I did download the relevant LROC image, all 500 MB of it, but I have so far been unable to find a way to open and process full-resolution LROC images in all their 16-bit glory. I'm working on it! 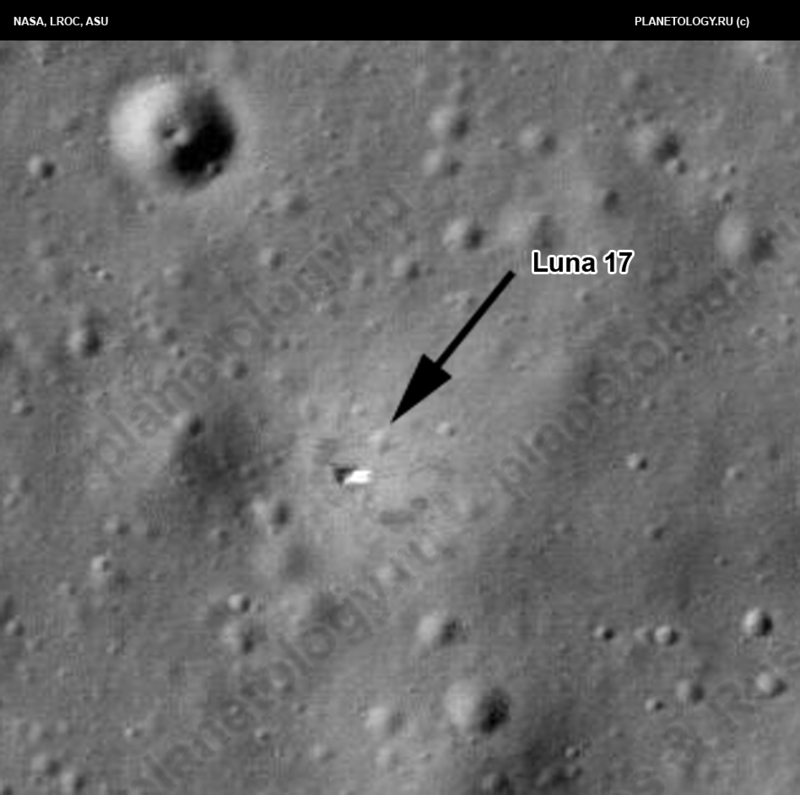 Luna 17 sits on the surface of the Moon as seen in a photo taken from orbit by Lunar Reconnaissance Orbiter on November 30, 2009. The approximate coordinates of the lander are 38.2473 N, 325.002 E. Resolution of the full-size image is 0.514 meters per pixel. I'm sure I'll have more to post on this in the next day or so!